In the Resources pane, select your dataset. In the Details page, click the pencil icon next to Description to edit the description text. In the dialog, enter a description in the box or edit the existing description. Click Update to save the new description text. In the navigation pane, select your dataset. On the Dataset Details page, in the Description section, click Describe this dataset to open the description box if the dataset has no description. Otherwise, click the existing description text. Enter a description in the box or edit the existing description. When you click away from the box, the text is saved. Issue the bq update command with the --description flag. If you are updating a dataset in a project other than your default project, add the project ID to the dataset name in the following format: [PROJECT_ID]:[DATASET]. [DESCRIPTION] is the text that describes the dataset in quotes. [DATASET] is the name of the dataset you're updating. Enter the following command to change the description of mydataset to "Description of mydataset." mydataset is in your default project. Enter the following command to change the description of mydataset to "Description of mydataset." The dataset is in myotherproject, not your default project. Call datasets.patch and use the description property to apply your dataset description. Because the datasets.update method replaces the entire dataset resource, the datasets.patch method is preferred. Create a Dataset.Builder instance from an existing Dataset instance with the Dataset.toBuilder() method. 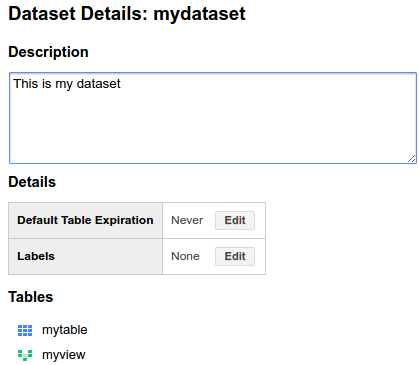 Configure the dataset builder object. Build the updated dataset with the Dataset.Builder.build() method, and call the Dataset.update() method to send the update to the API. Configure the Dataset.description property and call Client.update_dataset() to send the update to the API. You can set a default table expiration time at the dataset level, or you can set a table's expiration time when the table is created. If you set the expiration when the table is created, the dataset's default table expiration is ignored. If you do not set a default table expiration at the dataset level, and you do not set a table expiration when the table is created, the table never expires and you must delete the table manually. If you change the value from Never to a defined expiration time, any tables that already exist in the dataset will not expire unless the expiration time was set on the table when it was created. If you are changing the value for the default table expiration, any tables that already exist expire according to the original table expiration setting. Any new tables created in the dataset have the new table expiration setting applied unless you specify a different table expiration on the table when it is created. In the GCP Console and the classic BigQuery web UI, expiration is expressed in days. In the command-line tool, expiration is expressed in seconds. In the API, expiration is expressed in milliseconds. 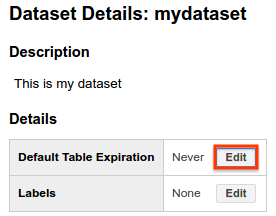 On the Dataset Details page, in the Details section, to the right of Default Table Expiration, click Edit. In the Update Expiration dialog, for Data expiration, click In and enter the expiration time in days. The default value is Never. To update the default expiration time for newly created tables in a dataset, enter the bq update command with the --default_table_expiration flag. If you are updating a dataset in a project other than your default project, add the project ID to the dataset name in the following format: [PROJECT_ID]:[DATASET]. [INTEGER] is the default lifetime (in seconds) for newly-created tables. The minimum value is 3600 seconds (one hour). The expiration time evaluates to the current time plus the integer value. Specify 0 to remove the existing expiration time. Any table created in the dataset is deleted after [INTEGER] seconds from its creation time. This value is applied if you do not set a table expiration when the table is created. Enter the following command to set the default table expiration for new tables created in mydataset to two hours (7200 seconds) from the current time. The dataset is in your default project. Enter the following command to set the default table expiration for new tables created in mydataset to two hours (7200 seconds) from the current time. The dataset is in myotherproject, not your default project. Call datasets.patch and use the defaultTableExpirationMs property to apply your default table expiration in milliseconds. Because the datasets.update method replaces the entire dataset resource, the datasets.patch method is preferred. Configure the default expiration time with the Dataset.Builder.setDefaultTableLifetime() method. Configure the Dataset.default_table_expiration_ms property and call Client.update_dataset() to send the update to the API. Setting or updating a dataset's default partition expiration is not currently supported by the GCP Console or the classic BigQuery web UI. You can set a default partition expiration time at the dataset level that affects all newly created partitioned tables, or you can set a partition expiration time for individual tables when the partitioned tables are created. If you set the default partition expiration at the dataset level, and you set the default table expiration at the dataset level, new partitioned tables will only have a partition expiration. If both options are set, the default partition expiration overrides the default table expiration. If you set the partition expiration time when the partitioned table is created, that value overrides the dataset-level default partition expiration if it exists. If you do not set a default partition expiration at the dataset level, and you do not set a partition expiration when the table is created, the partitions never expire and you must delete the partitions manually. When you set a default partition expiration on a dataset, the expiration applies to all partitions in all partitioned tables created in the dataset. When you set the partition expiration on a table, the expiration applies to all partitions created in the specified table. Currently, you cannot apply different expiration times to different partitions in the same table. If you change the value from "never" to a defined expiration time, any partitions that already exist in partitioned tables in the dataset will not expire unless the partition expiration time was set on the table when it was created. If you are changing the value for the default partition expiration, any partitions in existing partitioned tables expire according to the original default partition expiration. Any new partitioned tables created in the dataset have the new default partition expiration setting applied unless you specify a different partition expiration on the table when it is created. Updating a dataset's default partition expiration is not currently supported by the BigQuery web UI. To update the default expiration time for a dataset, enter the bq update command with the --default_partition_expiration flag. If you are updating a dataset in a project other than your default project, add the project ID to the dataset name in the following format: [PROJECT_ID]:[DATASET]. [INTEGER] is the default lifetime (in seconds) for partitions in newly-created partitioned tables. This flag has no minimum value. Specify 0 to remove the existing expiration time. Any partitions in newly-created partitioned tables are deleted after [INTEGER] seconds from the partition date. This value is applied if you do not set a partition expiration on the table when it is created. Enter the following command to set the default partition expiration for new partitioned tables created in mydataset to 26 hours (93,600 seconds). The dataset is in your default project. Enter the following command to set the default partition expiration for new partitioned tables created in mydataset to 26 hours (93,600 seconds). The dataset is in myotherproject, not your default project. Call datasets.patch and use the defaultPartitionExpirationMs property to apply your default partition expiration in milliseconds. Because the datasets.update method replaces the entire dataset resource, the datasets.patch method is preferred. The process for updating a dataset's access controls is very similar to the process for assigning access controls to a dataset. Access controls cannot be applied during dataset creation using the GCP Console, the classic BigQuery web UI or the command-line tool. You must create the dataset first and then update the dataset's access controls. The API allows you to update dataset access controls by calling the datasets.patch method. Remove existing entries by clicking the X icon to the right of the user, group, or service account. Change permissions for a user, group, or service account by clicking the permissions button and choosing an appropriate access level: Is owner (OWNER), Can edit (WRITER), or Can view (READER). For more information on dataset-level roles, see Primitive roles for datasets. Click the drop-down to the left of the Add People field and choose the appropriate option. Type a value in the text box. For example, if you chose User by e-mail, type the user's email address. When you are done adding, deleting, or modifying your access controls, click Save changes. Verify your access controls by clicking the drop-down arrow to the right of the dataset and choosing Share Dataset. You can confirm the settings in the Share Dataset dialog. Call the datasets.patch and use the access property to update your access controls. For more information, see Datasets. Configure the access controls with the Dataset.Builder.setAcl() method. // Make a copy of the ACLs so that they can be modified. For more information on managing datasets, see Managing datasets.